What do you pair with a beer like Saison du BUFF? An American saison that’s flavoured with parsley, sage, rosemary and thyme! The cogs churn through the extraordinary: chocolate, coffee, red fruits; but settle on something a bit more safe. I’ve always had something of an addiction for baking bread; if not for the early mornings, crap salary and shiny allure of IT, I might even be a baker today. The classic combination of rosemary, sea salt and olive oil pops into my head; combine with that safety net of flour and water and we’re focaccia bound from here on out. How much do I want? Lots! Then I’ll need a lot of flour! One packet of yeast, salt, some olive oil if it suits and then enough water to bring it together. Knead it to the point that you think you’ve kneaded it enough, then knead it some more. Stick it in a bowl, leave it for an hour. Punch it in the face and then knead it some more. Shape, leave to double in size, bake. 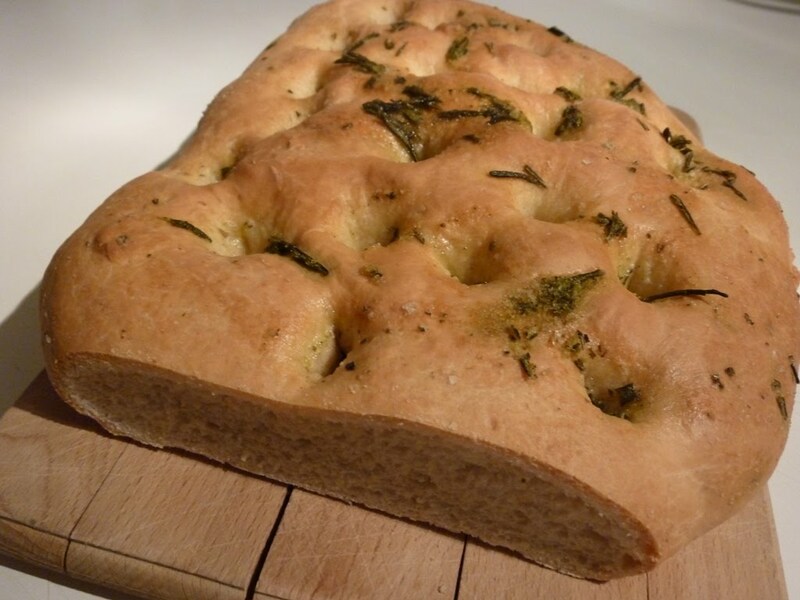 When making focaccia, I use the handle of a wooden spoon to push holes into the surface of the bread just before it goes into the oven. Salt, rosemary and good olive oil are pounded together in a pestle and mortar, then rubbed all over the bread. Saison du BUFF is an interesting beer. Oddly interesting. I’m not really sure I like it. The flavour profile is dominated by the herbs, mainly rosemary in fact, then in comes a Belgian yeast character that feels grubby and dirty, it’s sulphurous and bitter and not very nice. The two elements clash badly and you’re left thinking: nice idea in theory, not so great in practice. On the other, the bread turned out brilliantly; lovely peppery olive oil, fragrant rosemary and an assertive saltiness. Delicious. I haven't had the beer but I've been intrigued by it... until now. I'd like to do all three different versions side by side to see the variations of each brewery. As for the bread... it looks great! Like the recipe too! Yeah, all three versions against each other would be really interesting. I dunno, just something about that herb flavour and the Belgian yeast didn't sit right for me. Sort of like Stone Cali-Belgique where the hops clash with the yeast. I want to do the Focaccia with sliced onions and grated Gruyere cheese some time. I think I know the perfect beer for pairing with it too.